Everyone loves an underdog. In The Natural, a ballplayer named Roy Hobbs (played by Robert Redford) arrives out of nowhere to the Major Leagues. He’s pushing 40, and his manager and teammates don’t want him around, but Hobbs is a born superstar, the man from parts unknown who makes history happen with improbable home runs on a nightly basis. Then he nearly dies winning a game and lives happily ever after with Glenn Close. Do such things ever happen in pro baseball? Not really. The grand old game is the great equalizer, so it’s impossible to bluff your way through the league for long. Yet that doesn’t stop fans and ballclubs from believing the journeyman reliever or aging slugger is the next Roy Hobbs, that player finding his groove at that perfect moment in time. The 2014 MLB season has featured players whose stories are almost that unbelievable. All things considered, there aren’t a whole lot of people surprised by the success of Masahiro Tanaka and Jose Abreu. Both players entered the big leagues after dominating in their home countries (Japan and Cuba, respectively) for years. Players such as Chris Colabello and Jesse Chavez, on the other hand, have made this MLB season special. Here are the six surprise MLB stars of 2014.
Who the hell is Charlie Blackmon? If it weren’t for Rockies teammate Troy Tulowitzki, Blackmon would be leading all MLB with his .369 batting average through the first chunk of the season. Blackmon got his shot at being an everyday player with the trade of Dexter Fowler, and he’s making the most of it. The 27-year-old has never seen more than 250 at-bats in an MLB season, but he’s going to have a lot of leeway in 2014 if he keeps up this production (OPS: 1.014). In fact, Blackmon’s exceptional outfield play have made him one of the leaders in defensive wins against replacement (DWAR). Best Blackmon highlight: his 6-for-6, 5 RBI performance against the Diamondbacks on April 4. If you like pitchers who throw 100 mph or better, it’s time to get acquainted with Yordano Ventura. Listed as the No. 32 MLB prospect before the 2014 season, Ventura has been sending the radar guns into fits on the mound for Kansas City. He’s locating the ball as well as he’s throwing it. In five games started, Ventura has an American League-best 1.50 ERA over 30 innings. Good old country hardball still works in 2014. The 22-year-old Dominican native has struck out thirty-one batters, better than one per inning. MLB might need to adjust its prospect pecking order, as Ventura seems a shade better than No. 32. 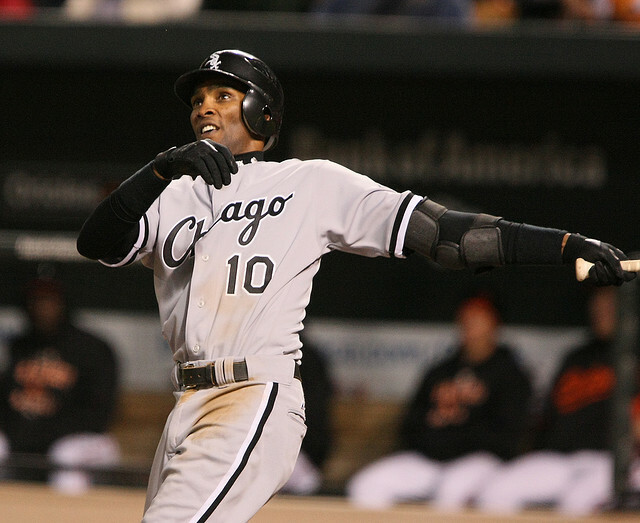 He didn’t come from nowhere, but that doesn’t make Alexei Ramirez’s 2014 season any less surprising. Ramirez has been scorching at the plate with an AL-leading .351 batting average through the first chunk of the season. To put it in perspective, the seven-year MLB veteran has never hit above .300 in his career (his highest mark was .290 in 2008). With 19 RBI in 114 at-bats, he appears poised to shatter his career high of 73 (2012). As for his 2013 total of 48 RBI, Ramirez will probably clear that mark by the All Star break. Chris Colabello has the closest story to Roy Hobbs of any of the surprise MLB stars of 2014. Undrafted and unable to even appear in the big leagues before the age of 29 (in 2013), Colabello was playing in New England’s Cam-Am (minor) League when his team, the Worcester Tornadoes, was reportedly shut down because it couldn’t pay for uniform cleaning in 2012, according to ESPN. Fast forward to week one of the 2014 MLB season, when Colabello was sharing AL Player of the Week honors with the Angels’ Josh Hamilton. Through May 2, Colabello has the second-highest RBI total in all baseball (27) and is hitting .290. Has he found his way at the age of 30? Colabello’s improbable rise from what Twins manager Ron Gardenhire called “the beer leagues” (per Twins Daily) to the show already has shades of The Natural. Why not dare to dream for more? If you ask the man once known as “K-Rod” where he’s been since his last stint as a dominant closer, Francisco Rodriguez will tell you he never left. Following an embarrassing ride with the Mets and ineffectiveness for several years, Rodriguez is back in Milwaukee with his closer mojo working again. As of May 2, he’s leading all MLB with 13 saves in 13 chances, but that’s only half the story. With an ERA of 0.00 and 23 strikeouts in 16 innings, K-Rod has earned his nickname back. Expect to see the postgame celebrations creep back in along with the rest of the classic K-Rod swag. Milwaukee is riding high in 2014, and its surprise star closer is a key ingredient. Like Chris Colabello, A’s starter Jesse Chavez took a long time to make it into a big-league rotation. Chavez pitched for five big-league teams in six years out of the bullpen, compiling forgettable stats and likely wondering if he’d be able to stay in pro baseball. With two injuries to A’s starters in spring training, he won himself a starting job for Oakland and has been lights-out ever since. In six starts, Chavez is 2-1 with a sparkling 1.89 ERA and 41 strikeouts in 38 innings. His devastating curve and fastball command have been overwhelming for hitters. How did he find the magic formula at age 30? Coming into the season, Chavez had a career ERA over 5.00, so saying he’s been a surprise star in 2014 is an understatement of epic proportions. Hopefully, this story will end as cool as The Natural did.